The in-between of Christmas and New Years is kind of a weird time. Kiddos are off from school, travel wraps up, house guests leave, there’s still a holiday coming up, and there’s some more work in between. I also think there’s so much pressure for New Year’s Eve and resolutions. It is just a weird time. I was on a quick-dinner-kick before the holidays and have just one more that I wanted to share for a keep-in-your-back pocket pantry. It also works for a great #meatlessmonday and a break from extravagant or elaborate holiday dinners. Boil salted water for pasta. 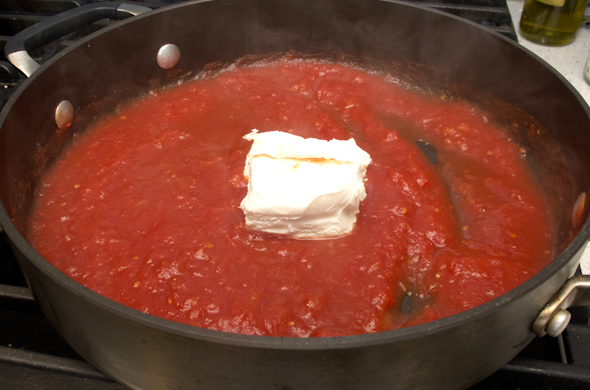 Heat a flat pan to medium-low heat, adding tomatoes to the pan. Boil pasta until undercooked and almost al dente. 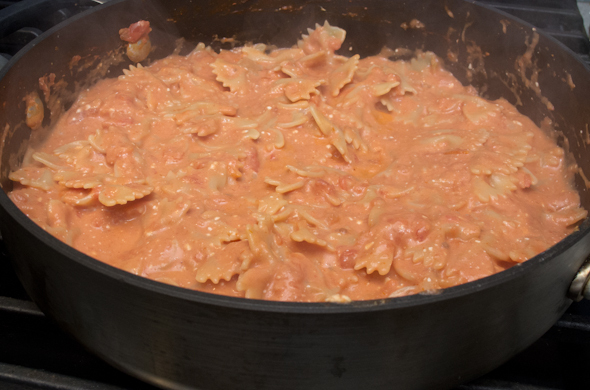 Add in the partially cooked pasta, letting it cook for a few more minutes in the sauce, adding the basil. 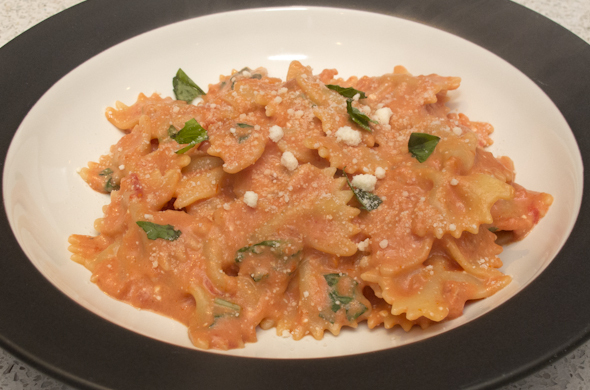 Sprinkle with Parmesan and more basil to serve! It is super easy and delightfully comforting. This pasta is just so fast yet it still seems like not the same-old same-old. Any resolutions coming up? I tend to make them on my blogaversary but I’m thinking I might set a year-of challenge for myself. I have a few ideas brewing so stay tuned! Happy holidays from The Three Bite Rule! 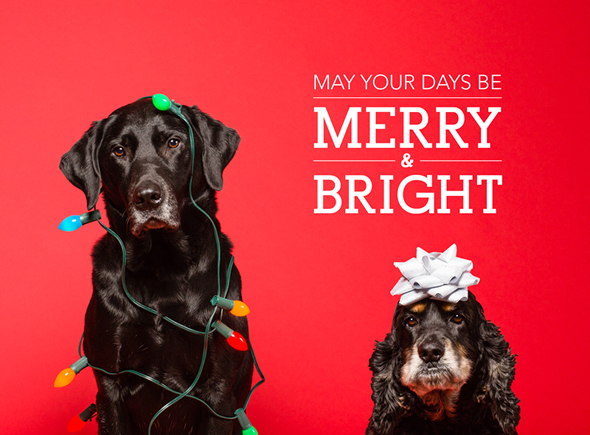 Mr. J did such a fantastic job with our holiday card featuring our furry cuties so I just had to share. I’ll be back after Christmas! Eat well! This is the season of intense foods, holiday parties, hot chocolate based cocktails, and seasonal candy. 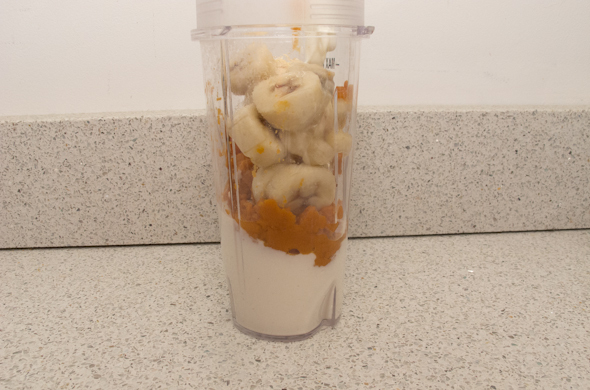 I figured a few meals should off-set those delicious things. 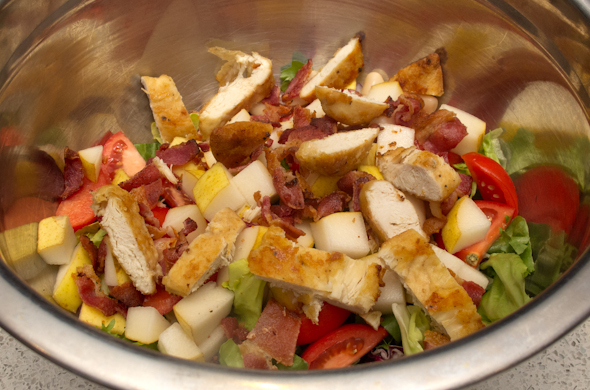 I threw this salad together calling it a Wintry Salad on our meal planning calendar and Mr. J found it comical. What’s winter about salad he asks? 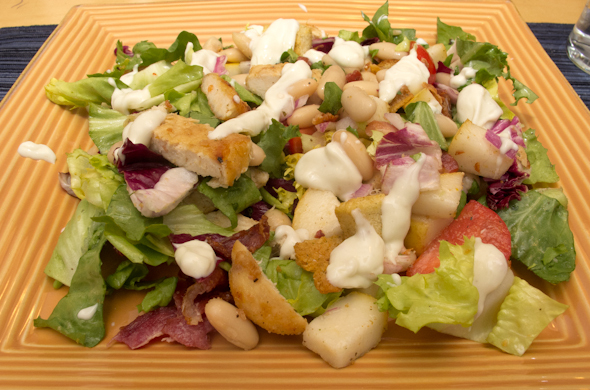 I say white beans, pears, and blue cheese dressing make a subtle nod to winter. Either way, we should eat more salads for dinner. 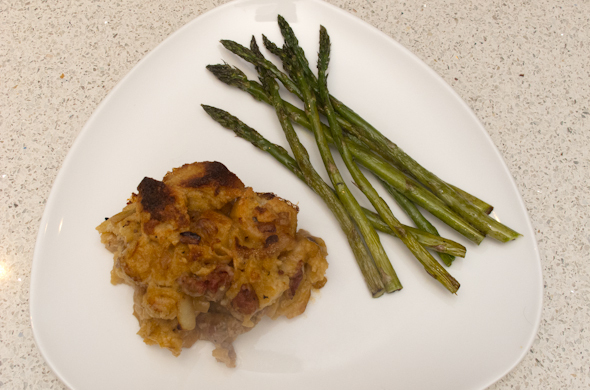 This one is hearty and filling while still getting lots of veggies to you. I had 3 chicken tenders I lightly breaded and cooked, but didn’t use and then froze them. I forget what they had been for, but that was the perfect amount of chicken for some protein without being a ton. I made enough salad for 2 of us for dinner and one for Mr. J to take for lunch. That equates to 1 chicken tender per serving. Plus 2 strips of bacon crumbled, into 3 servings. Basically, I just want to remind you that the amount of protein on salad can be wayyy less than you’d serve otherwise. I tossed it with a tiny bit of Italian dressing. That helps reduce how much creamy dressing anyone will “need”. I love the ease of calzones and this one is ideal to feed your hungry house guests or to keep your weeknights productive with simplicity or to be a hefty appetizer or a potluck star. I mean, I don’t know about you, but I haven’t finished wrapping Christmas presents and there are about a bejillion holiday movies on tv right now. Keeping wiggle room on weeknights is definitely what I need. This is not a far cry from my Chicken Parmesan Pizza, but I want to save you from a lackluster Chicken Parm calzone if you were thinking of chicken and mozzarella. That’s not enough, but of course you weren’t thinking that. 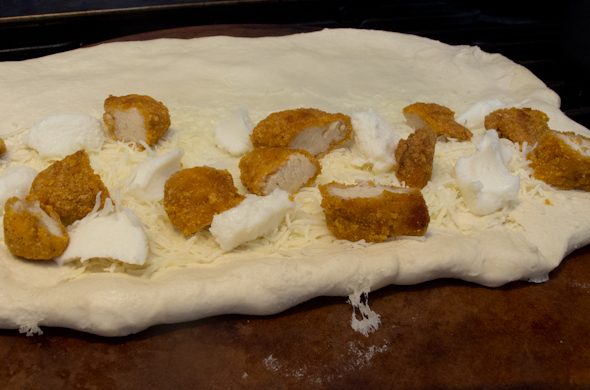 That’s almost enough for topping a Chicken Parmesan pizza but in a calzone it will be underwhelming and seem empty. Don’t forget to fill, fill, fill the calzone. It seems like wayyy less when you bake & slice it up. 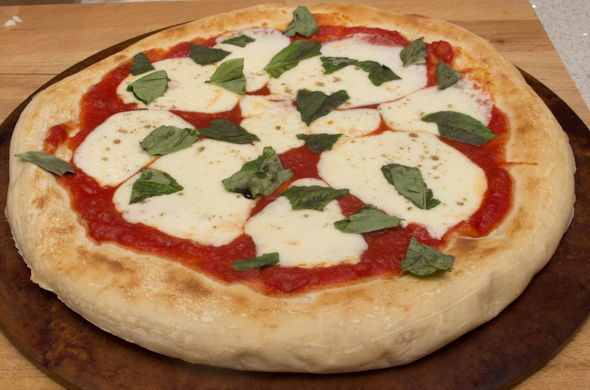 Preheat the oven, and pizza stone if using one, to 400 degrees. 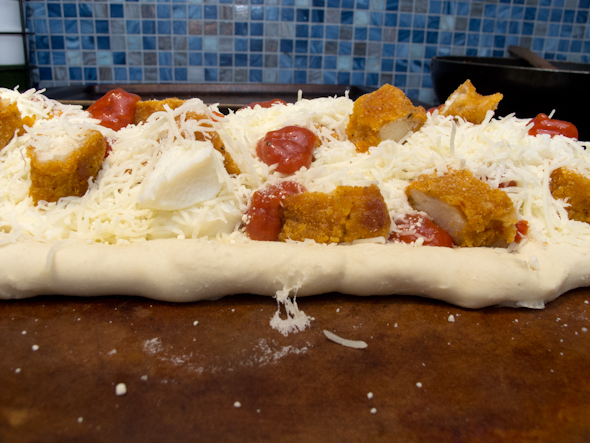 Spread the pizza dough onto the pizza stone or pizza pan, off center so the filling can be on the “bottom” and the “top” can fold over. When the dough goes onto a hot pan it cooks a bit to hold the form. Layer chicken chunks, mozzarella, ricotta spoonfuls, Parmesan, and tomato drizzles. 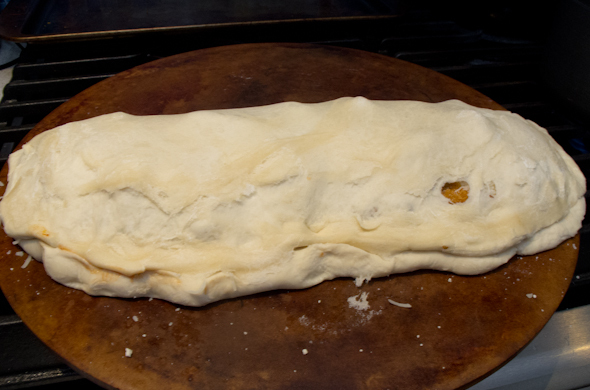 Keep layering and making sure there’s filling all the way to the edges. Fill more than it seems like it needs. Keep filling, and filling, and filling. Fold the top over and pinch the edges together. Gently “squish” the fillings to the edges to pat it down a bit. Slice some vents into the top, spacing them out and keeping any unplanned vents. Bake 30 minutes. Optional: Brush with olive oil or eggwash for a shiny top midway through. Remove from the oven and let sit for 5 minutes before slicing. This is an easy one that is ohh so comforting. 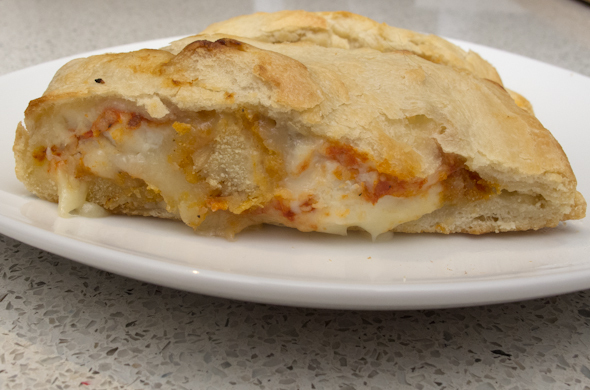 It is very simple but hits some flavors everyone likes, plus calzones are great as leftovers. I put tomato sauce into this calzone, but I normally just serve it on the side. I also would love slices of fresh mozzarella in here but I was trying to keep it pretty simple. I made a few pizzas and a few calzones for guests. This one was a good crowd-pleaser amongst some other flavors. The chicken parmesan calzone helped the menu since I could prep it and partially cook it in advance. I paired this guy with a bruschetta pizza, a BBQ chicken pizza, and a pepperoni pizza for the kiddies. Something for everyone! I’ve been thinking about meals that are speedy yet delicious. Mr. J has been rushing around to get our holiday card photo done (gonna be AHHH-MAZING) and I’ve been trying to finish up some shopping (thanks to Amazon prime!) and I’ve been decorating so my focus has been on some meals that we’ll enjoy but that aren’t as elaborate as they sometimes can get. Enjoy these ideas, and leave a comment with your own suggestions! 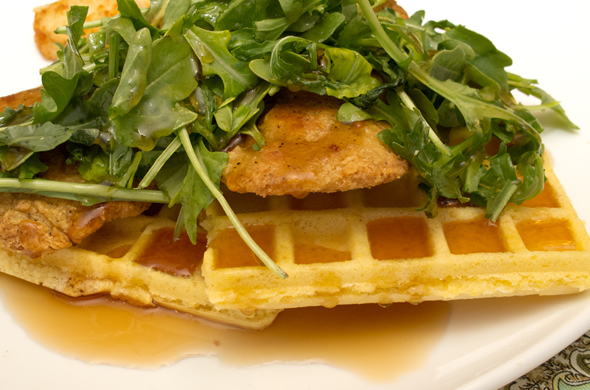 Chicken and waffles makes a quick meal. I made the waffles with some cornmeal and hot sauce in this post but if you find some in your freezer you’ll be halfway to dinner! From Away blogged about some to-die-for chicken and waffle nachos with maple and sriracha. 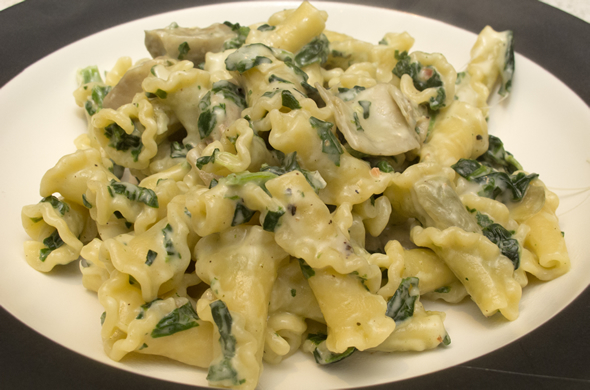 I absolutely love this spinach and artichoke pasta. The trick is creamed spinach from the freezer section. It takes longer for the pasta water to boil than anything else! 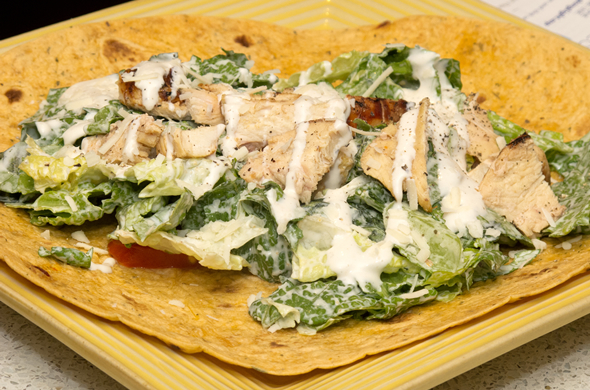 Maybe your grill is covered in snow, but grilling some chicken inside, or getting already cooked chicken would make Chicken Caesar Salad Wraps super quick. Lastly, when all else fails, breakfast for dinner. Mr. J makes a mean huevos rancheros. 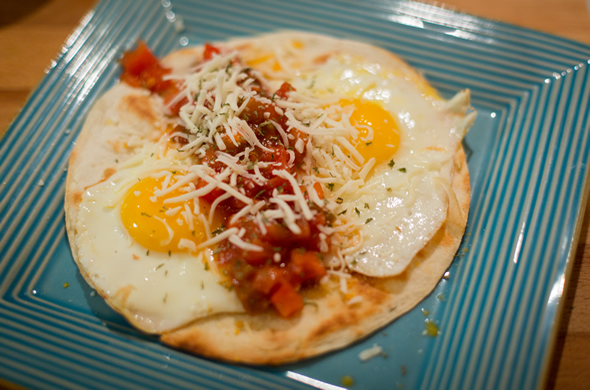 All you need is: tortillas, eggs, salsa, and cheese. 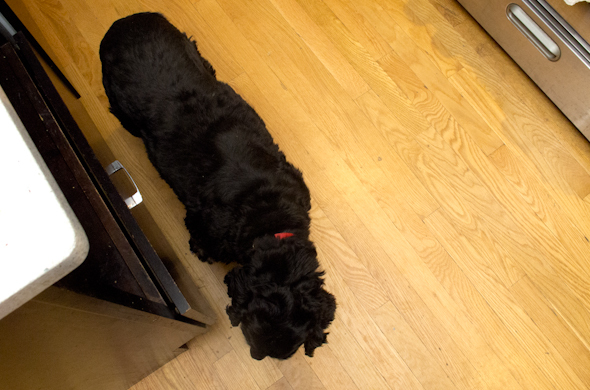 What’s for dinner in your kitchen when you’re busy busy busy? I cannot even put into words how amazing this soup was. One of my favorite things I’ve cooked in awhile. Gahhh. It is so amazing and I want to make it again immediately. It is the perfect non-grilling-weather way to taste a cheeseburger. The tomato flavor and garlic and onions seemed spot on flavors to make me think of a burger. 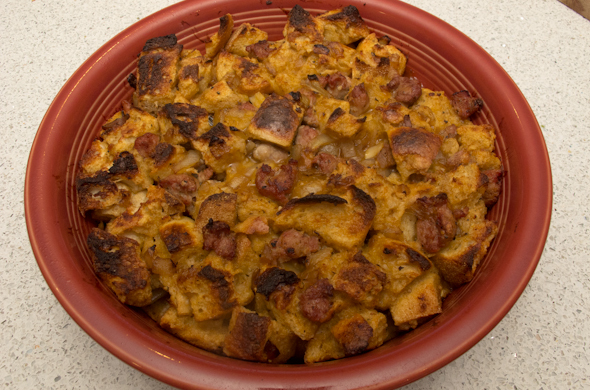 I tweaked a recipe I saw on Family Fresh Meals. That one uses a crockpot and I was making this on speed. I also didn’t include the bacon that this recipe did. I know! I know! Blasphemy. I was attempting to lighten this soup up just a bit while maintaing the flavors. 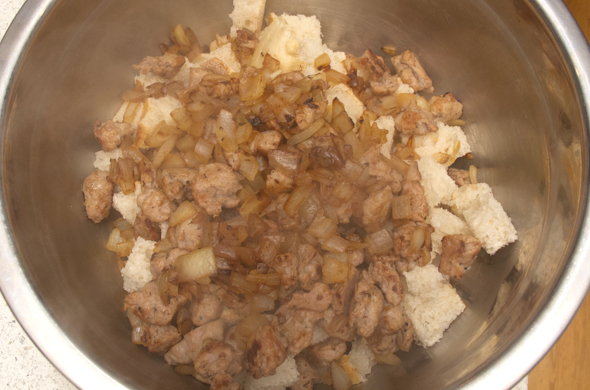 I skipped the potatoes, used less cream cheese, nixed the milk/flour slurry, and swapped beef for ground chicken. But then I served it in mini breadbowls so maybe lightening it up didn’t really do much. Next time I might even skip the shredded cheese and just sprinkle some on to serve it. Gasp! I skipped the crockpot since I didn’t think there were that many more flavors to develop here. 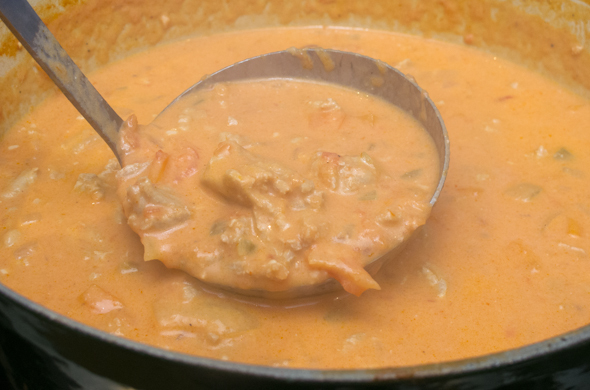 Some things (read: chili, pork shoulder, etc) develop more and better flavors the longer they cook. This one wasn’t likely to do that, but don’t get me wrong, crockpots are great to keep food hot for a crowd. 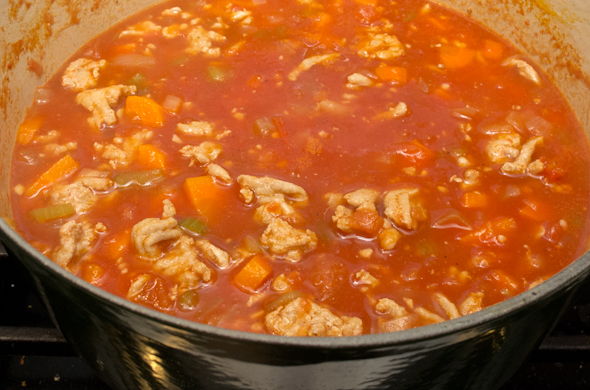 Heat a large heavy pot (to become the soup pot) over medium-high heat and heat a large skillet (for the ground chicken) over medium heat. Peal the carrots, and chop carrots, celery, and onion. 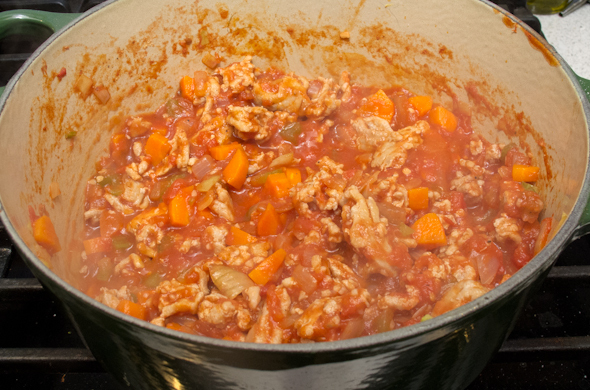 In a large skillet, brown the ground chicken until cooked most of the way through. 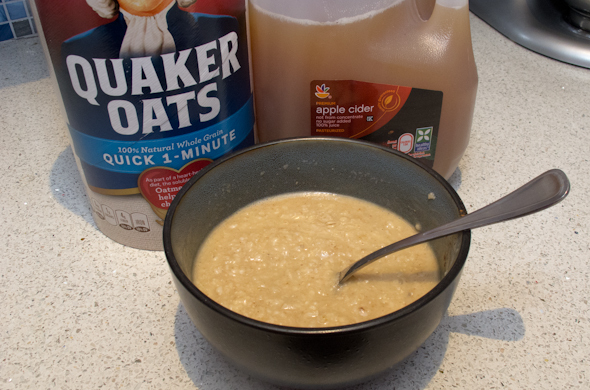 Break into crumbles with the back of a spoon. 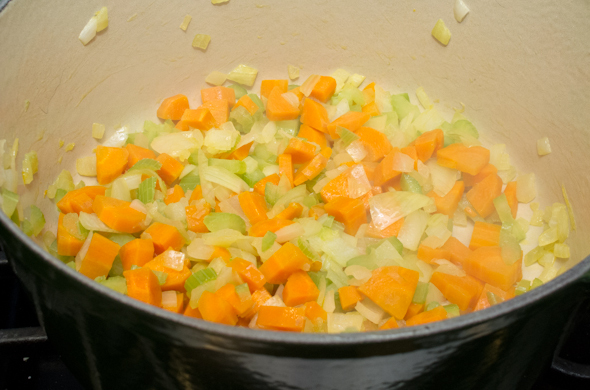 In the soup pot, add in 1 tbs olive oil, chopped carrots, chopped celery, and chopped onion cooking for about 10 minutes. Drain the meat discarding any excess fat/grease and add to the soup pot. Add in the crushed tomatoes. 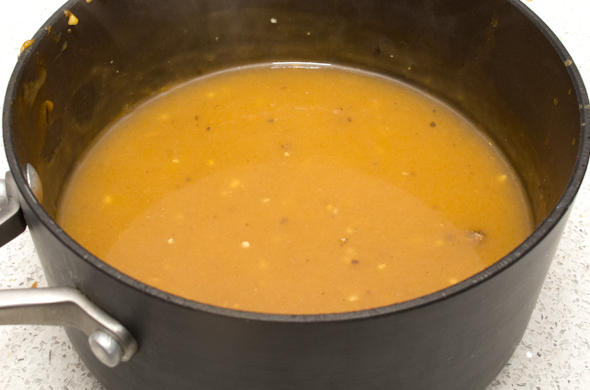 Add in chicken broth, worcestershire sauce, mustard, salt, pepper, and garlic powder, stirring well. Cook for another 10-15 minutes covered. 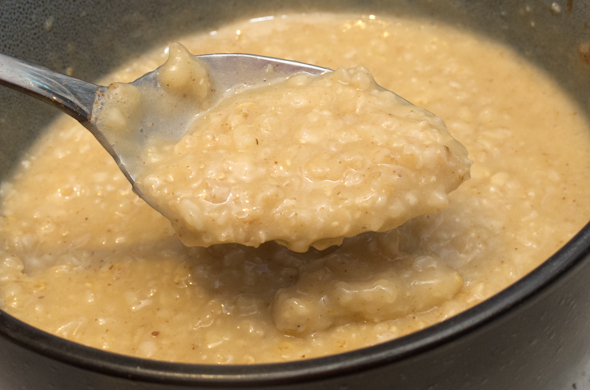 It was at a low boil which helped it thicken up a bit (without needing a milk/flour slurry). Uncover and reduce heat to low. Add in the cream cheese, stirring well as it melts. Finally, add in the shredded cheese. Stir to melt. 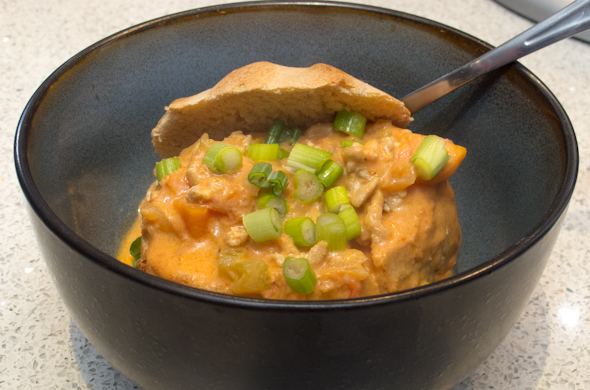 Serve topped with green onions in mini-bread bowls! This is a serious crowd pleaser. I loved it and would totally make it again! I was a bit heavy handed with the green onions, don’t do that. 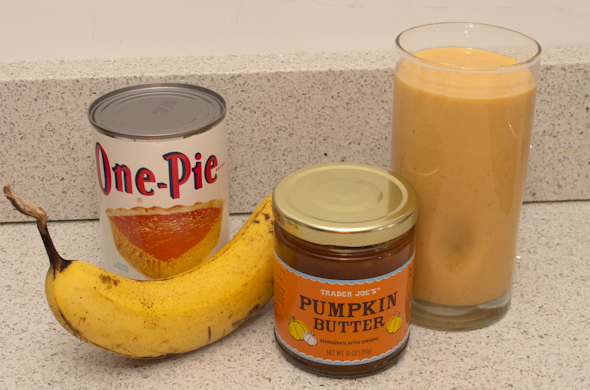 This was pretty quick but is a recipe where you could do some prep in advance. 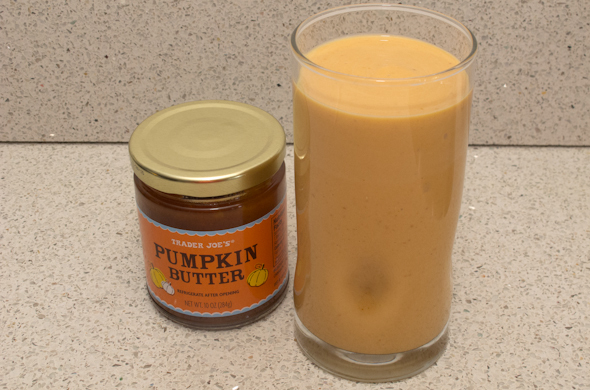 You could make pretty much the whole thing in advance and refrigerate or freeze it until needed – I’d leave off the cream cheese until just before serving. I split a ball of pizza dough into 3-4 balls to bake into bread bowls. Just bake, let cool, slice off the tops, and hollow out the middle. 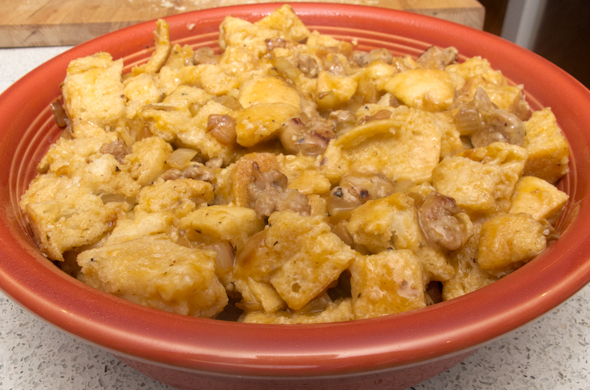 This would be a perfect recipe to whip up for some family or for a potluck. It could surely be a time savor (and leftover source) during this very busy time of year. 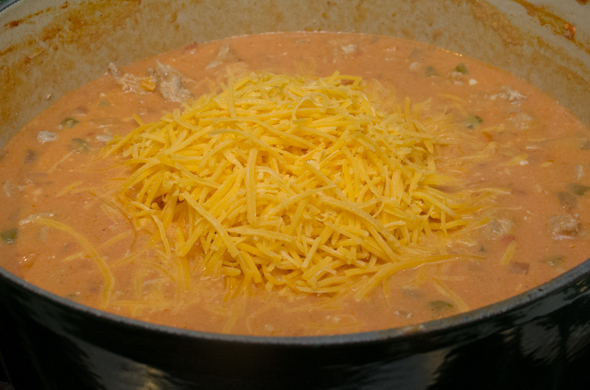 this recipe + some beans + cooked longer + cumin = cheeseburger chili!